Legumes are members of the Fabaceae (also called Leguminosae) family of flowering plants. They are one of the largest plant families and include beans, peas, peanuts, lupines, alfalfa, clover, acacia, and many others. Fabaceae is known variously as the legume family, pea family, bean family, or pulse family. The word "legume" can also refer to the type of fruit that is characteristic of most of the species of this family. A legume in this sense is a simple, dry fruit that develops from a simple carpel (female reproductive organ of a flower) and usually dehisces (opens along a seam) on two sides releasing the seeds that are attached to one or both seams. All members of this family have five-petaled flowers in which the superior ovary (an ovary attached to the receptacle above the attachment of other floral parts) ripens to form a "pod," technically called a legume. Through a symbiotic relationship (mutualism) with nitrogen-fixing bacteria, legumes are able to convert atmospheric nitrogen into a form that plants can use. This harmonious relationship between legumes and bacteria is a very important process for life as we know it. Thanks to legumes' nitrogen-fixing capabilities they can be grown without supplemental fertilizer as is needed by most other kinds of agricultural crops. The term is derived from the French word "légume" (which, however, has a wider meaning and refers to any kind of vegetable). The French word comes from the Latin word legumen, which means "anything that can be gathered." 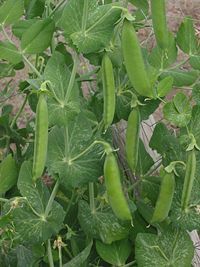 The legumes were among the first plants cultivated by humans and are still among the most important agricultural crops. Caesalpinioideae: The flowers are zygomorphic, not perfectly symmetrical, but are very variable, for example, closely resembling Faboideae flowers in Cercis, while symmetrical with five equal petals in Bauhinia. Most of the Caesalpiniodieae are shrubs and trees. Among them are Brazilwood, Royal Poinciana, Honey locust, and the Redbuds. Mimosoideae: The petals are small and the stamens are the showiest part of the flower. Among the Mimosoideae are the Acacia and Mesquite. Faboideae or Papilionoideae (Fabaceae sensu strictu or Papilionaceae): One petal is large and has a crease in it; the two adjacent petals are on the sides, and the two bottom petals are joined together at the bottom, forming a boat-like structure. Most of the legumes, including those well-known as food crops, are in this sub-family. Most legumes, through a symbiotic relationship with certain bacteria called rhizobia (from the Greek words riza, meaning root, and bios, meaning life), are able to take nitrogen from the air and "fix" it, that is change it into chemical compounds that can be used by plants. This is the process of nitrogen fixation. The nitrogen is then available to be used by animals that eat the legume plants and by other plants when it is absorbed by the soil after the legumes' death. This is tremendously important since nitrogen is an essential part of amino acids and nucleic acids, both of which are essential to all life. Nitrogen-fixing legumes form nodules on their roots in which the bacteria live, receiving carbohydrates from the plant, and in which nitrogen is produced and stored. The great majority of legumes have this association, but a few genera (e.g., Styphnolobium) do not. Nitrogen is also fixed by bacteria living in the soil itself and in the atmosphere due to the action of lightning. There are around 18,000 species of legumes. They grow world-wide in many different environments. Some are annual herbs, some are vines, and some are bushes and trees. They play important roles in many natural ecosystems because their nitrogen fixation enriches the soil. They also provide food for many animals. Many have beautiful flowers, such as lupine and albizia. 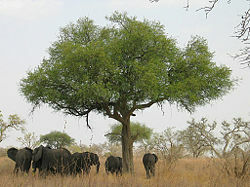 Acacias, genus Acacia, are one of the largest tree and shrub genera in the world. They mostly live in dry tropical and subtropical environments, with Australia having the most species. Some species form symbiotic relationships with ants in which the trees provide the ants with food from sap and special fruits. Hollow thorns act as nesting places and the ants protect the trees from grazing animals, other insects, and competing plants. Acacia senegal of North Africa provides gum arabic, which is an important additive in many foods. Many other Acacias provide valuable hardwoods, including the Koa tree, Acacia koa, of Hawaii and Acacia seyal from which it is said that the Ark of the Covenant was made. Acacia seeds are also used as food in Africa and also in Australia, where seeds gathered from about 120 species are an important part of the traditional diet of the native people (Armstrong 1998). 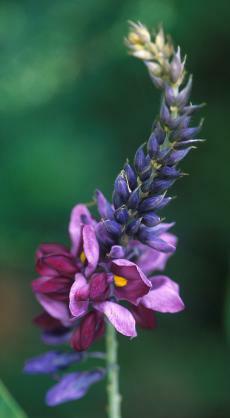 Kudzu, Pueraria lobata, is another well-known legume. It is native to eastern Asia and was introduced from Japan to the United States as livestock fodder and as a ground cover to control erosion. 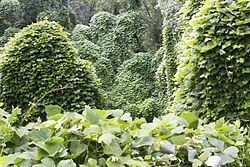 Because of its rapid growth and great size—it can grow as much as 30 cm (12 inches) a day in the right conditions—it has become a harmful, invasive species in much of the Southeast. It replaces native vegetation, even killing trees by covering them and cutting off their access to sunlight. In a study that examined food intake patterns and risk of death from coronary heart disease, researchers followed more than 12,000 middle-aged men in the United States, Finland, the Netherlands, Italy, former Yugoslavia, Greece, and Japan for 25 years (Menotti et al. 1999). Typical food patterns were higher consumption of dairy products in Northern Europe; higher consumption of meat in the United States; higher consumption of vegetables, legumes, fish, and wine in southern Europe; and higher consumption of cereals, soy products, and fish in Japan. When researchers analyzed this data in relation to the risk of death from heart disease, they found that legumes were associated with an 82 percent reduction in risk. Legumes were among the first plants cultivated by humans. One reason is that the large seeds of most species are easy to gather and store and they provide good nutritional value. Cultivated legumes fall into two classes: grain and forage. Grain legumes are cultivated for their seeds (legumes are also called pulses). The seeds are used for human and animal consumption or for the production of oils for industrial uses. 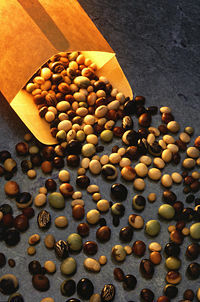 Grain legumes include beans, lentils, lupines, peas, and peanuts. Forage legumes, like alfalfa, clover and vetch, are sown in pasture and grazed by livestock or harvested as hay. Grain legumes were first cultivated in the Middle East, perhaps as long as 10,000 years ago. The first five species cultivated are considered "Neolithic founder crops" (the very first cultivated plants), along with flax, barley, and two species of wheat. These five founder legume species are the lentil Lens culinaris, the pea Pisum sativum, the chick pea Cicer arietinum, the bitter vetch Vicia ervilia, and the broad bean Vicia faba. The soybean, Glycine max was first cultivated in China, perhaps 5,000 years ago. It is now the most world's most important legume crop. 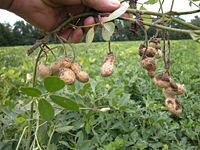 The common bean, Phaseolus vulgaris and the peanut, Arachis hypogaea, were first cultivated in the New World. There are also many other grain legume species cultivated around the world, and also many wild ones that are harvested in times of need by local people. Some of these are being investigated for their potential cultivation (Hymowitz 1990). One reason grain legumes are so important as crops is that they have high protein content. They are an important source of protein, as well as B vitamins and iron, for people living where meat is scarce or expensive and for vegetarians. Today India is the largest producer and consumer of grain legumes for human consumption (AEP 2006). Alfalfa, Medicago sativa, was one of the first forage legumes cultivated. It is native to Iran (ancient Persia) and was cultivated there soon after the introduction of the horse, around 3,000 to 4,000 years ago. It was spread to Europe when the Persian Empire invaded Greece around 490 B.C.E. Alfalfa is now an important crop in the United States being harvested as hay to feed cattle and horses. Clovers, members of the genus Trifolium with about 300 species, are also important forage legumes. They are most often planted along with grasses to provide forage for grazing animals, although sometimes they are harvested as hay. They are also edible by humans and are sometimes boiled and eaten in times of famine and emergency. Besides the valuable products they produce, another important reason legumes are grown is to restore the nitrogen to soil that has been depleted of it by other crops. As early as ancient Rome, writers on agriculture, including Pliny and Virgil, understood the value of using legumes like peas, beans, and vetches to enrich the soil. In some cases, the plants are plowed under before another crop, such as wheat, is planted. This is known as "green manure." Besides adding nitrogen, it also loosens the soil and enables it to hold more water. In the 1700s and 1800s in Europe and North America, crop rotation began to become widely practiced. Crops of legumes, such as alfalfa and beans, were grown in alternate years with grains, such as wheat and corn. This greatly increased the yields, while reducing the need for added fertilization. Sometimes a three or four year cycle of different crops was planted. The system of corn and soybeans grown in rotation has become one of the most important and productive farming patterns in the United States today (UM 2003). Armstrong, W. P. 1998. The Unforgettable Acacias Retrieved April 17, 2007. Hymowitz, T. 1990. Grain legumes. In: J. Janick and J.E. Simon (eds. ), Advances in New Crops. Portland, OR: Timber Press. Grain Legumes” Retrieved April 17, 2007.
International Legume Database & Information Service (ILDIS). 2006. World Database of Legumes. Retrieved April 17, 2007. University of Minnestota (UM). 2003. "Forage Legumes Retrieved April 17, 2007. Watson, R. 2004. A Closer Look at Legumes Retrieved April 17, 2007. This page was last modified on 24 June 2018, at 23:08.